Moviegoers thought your career might be dead, not just cursed, in the box office flop “The Mummy” earlier this year. They wondered if your career had really spiraled into “Oblivion” with that waste of time and don’t even get us started about your role as Stacee Jaxx in “Rock of Ages” because there isn’t enough hairspray, tight leather pants and tattoo ink to cover up that monstrosity of a film. Perhaps no actor is as good as playing the same character over and over again and remaining atop the Hollywood hierarchy as Cruise. What really was the difference between Lt. Daniel Kaffee in “A Few Good Men,” Brian Flanagan in “Cocktail,” Vincent in “Collateral” and Jerry Maguire? Nothing – all of them made the audience believe that they were always in control, even when it appeared they weren’t. 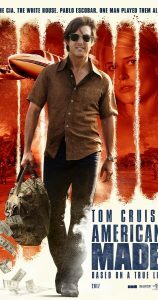 In his latest film, “American Made,” Cruise shows why that even at 50, he can carry a movie with the same authority as he did in his 20s. 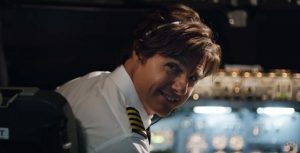 Without Cruise, “American Made,” flops. No other actor could pull of the leading role of Barry Seal, a hotshot pilot in the 1970s who went from transporting passengers for TWA to flying AK-47s to Nicaraguan Contras for the CIA and cocaine for Pablo Escobar quite like Cruise. He connects with the audience because deep down inside, plenty of moviegoers would love to be Barry Seal. Seal seemingly has it all – a hot wife (Sarah Wright, 34), kids and a stable job – but then he meets his would-be CIA handler Schafer (Domhnall Gleason) in a hotel bar while he’s unwinding from work. Overnight, Cruise becomes the country’s top superspy. He’s given an airplane with a camera and the next thing he knows, he’s dodging machine-gun firer while flying over military bases in Central in South America taking aerial shots for the CIA. And then he meets Pablo Escobar, Jorge Ochoa and Carlos Ledher of the Medellin Cartel, who naturally use Cruise’s piloting skills and his U.S. government-owned plane to transport cocaine into the United States, and just like that, Cruise goes from middle-class to upper-class, with more money than he can launder. Very few actors other Cruise could make Seal so lovable as he transports U.S. weapons Central American guerrilla factions intent on overtaking their country’s government one day and returns home with hundreds of kilos of Escobar’s cocaine the next. And he does it all in the name of patriotism because in his eyes – and in the eyes of the U.S. government – Cruise isn’t breaking the law if he’s doing it in the name of the good ol’ U.S. of A. It should come as no surprise that “American Made” is good. The film marks the reteaming of Cruise with director Doug Liman, who was behind 2014’s “Edge of Tomorrow,” which was easily Cruise’s best film in the past decade. Liman used Cruise as an extremely likable hero in that film and audiences responded by enabling it make more than $370 million at the world wide box office – not bad for a film with an $180 million budget. Cruise is pretty funny while he gets swept up into the government’s funny business. He’s vintage Cruise, with his deadpan humor, witty barbs and ability to convince the audience he’s in control even when he isn’t all on display throughout the two-hour film that has the look of a movie shot in the 1990s. “American Made” is based – albeit very, very loosely – on a time that Hollywood has largely ignored but at the crux of the film, this is undeniable: Tom Cruise best work isn’t in the past. ← Pterostilbene: is it better than red wine for good health?